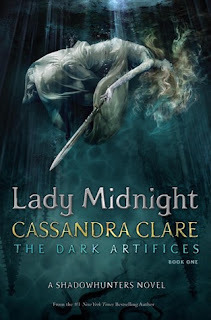 Umm Lady Midnight ... Like most Cassie Clare fans I've been eagerly awaiting this book for a long while. It turned up and I did my mini dance of joy. I pounced on it like a reader possessed but by the end I can't say I was wowed. Don't get me wrong. I did enjoy the book. I enjoyed being back in the world of the shadowhunters. I really enjoyed meeting the new characters and I loved hearing from the old ones. I really like Emma as a character and the way in which she goes about being a shadowhunter. I really enjoyed meeting the entire Blackthorn family. I liked how the characters are quite diverse. However there was something about this book that didn't just sit right with me. It could have been the length. This book is huge and it felt like sometimes the pace suffered for it as it got bogged down in detail. Equally the main story plot felt a bit like a City of Bones retelling to a certain extent and just didn't feel original enough. Also, dare I say it, it felt like for most of the book we were just waiting for the characters from the first series to rock up before anything actually got sorted. I am very interested to see where the rest of the series is going but I'm probably going to not get myself so excited before the release of the next one as I'm sure pr publication hype and excitement actually leaves me disappointed by the time I actually read the book.